I walked the beautiful trails at Bartholomew's Cobble last week. Bartholomew's Cobble is a 329-acre Trustees of Reservations property. It is known for its biological diversity with a wide array of birds, animals and plants notably ferns. 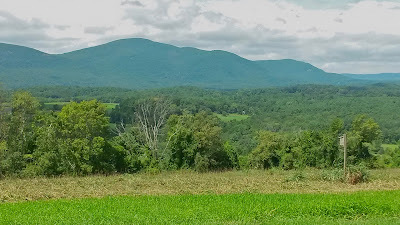 I enjoyed the trails along the Housatonic River and past rocky outcroppings, in pastures, and in the woods leading up to the large mowed field that is Hurlburt's Hill. 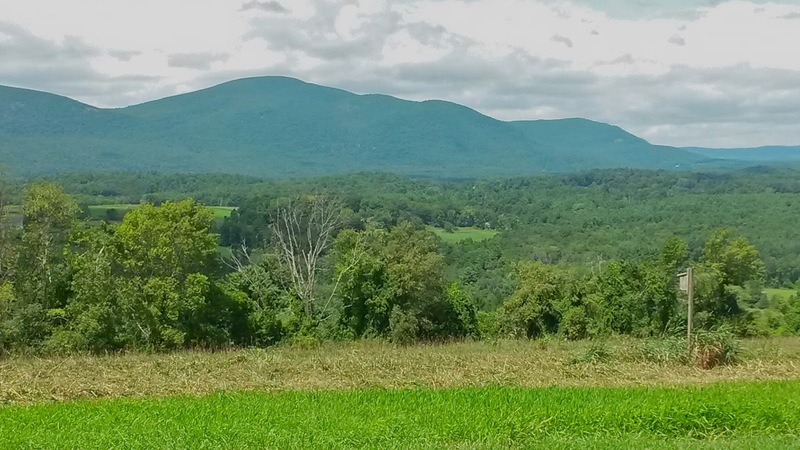 From there are amazing 180-degree views of the Berkshires and the Housatonic Valley. I usually go there in spring for the spring ephemeral flowers, but found late summer very different. I met a couple from the Boston area who said that for years they have been coming every season and find each visit remarkable in it's own way. What a great idea! I think I'll do that from now on. The trails are wide and clear, but do not venture off the path because of the abundance of poison ivy. while watching a red-tailed hawk flying overhead. Mt. Everett from Hurlburt's Hill. The Appalachian Trail goes along the top of the ridge.